Want to live stream NFL games on your mobile phone or tablet? For years this was a limited option only for Verizon users, but thanks to a new deal between Verizon and the NFL, it’s now easier than ever for all fans to watch all the NFL games broadcast in their area. In December of 2017, Verizon and the NFL agreed to a new 5 year deal that expanded the access of NFL live streaming to all mobile customers, not just Verizon. The deal has been reported to be somewhere in the neighborhood of $2 billion dollars over the term of the deal and will allow Verizon to stream live NFL games through it’s online properties, specifically Yahoo Sports. Verizon had closed a deal to acquire Yahoo earlier in 2017. 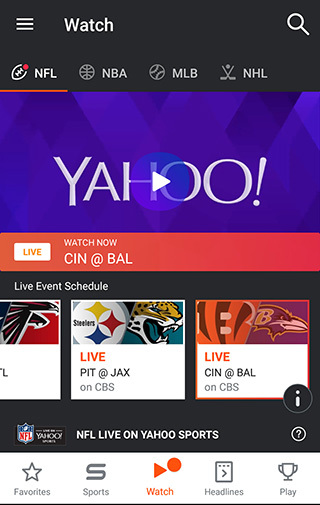 Both the Yahoo Sports app and the NFL app with give you free streams through the use of their mobile and tablet apps. Both the Yahoo Sports app and the NFL App are available for Android and iOS. Notes: You will need to have location services enabled for the live stream to work. The available games include all national preseason, local & primetime NFL regular season games, all playoff games, and the Super Bowl. If the game is broadcast in your area, regardless of whether it’s on local TV stations like Fox, CBS, and NBC, or if it’s a cable network like NFL Network or ESPN, you can watch the game on your phone or tablet. When you download and open the Yahoo Sports app, select the NFL and the “Watch” tab and you’ll see available and upcoming games to watch. According to Yahoo, there are a few games which are only available to stream on smartphones through the cellular connection.Those games include Jets vs Browns (9/20/18), Eagles and Jaguars (10/28/18), and the yet to be announced NFL games on both December 15th and December 22nd. Games can also be accessed through the AOL app and the Tumblr app. For more info, check out the faq. To watch the games, simply find the “Games” tab and find the available game or games to watch. The app doesn’t do as good a job as Yahoo of displaying the upcoming games however. An interesting quirk I noticed in the live stream coverage is that sometimes the available games are not the same n both apps. On this particular Sunday, I actually had one additional available game in the Yahoo Sports app than I did in the NFL app. 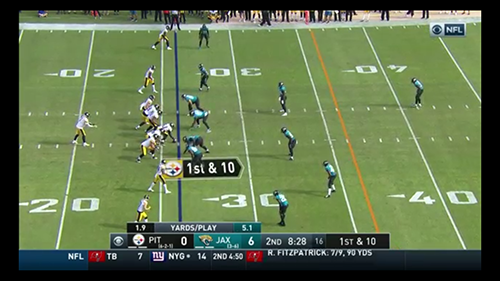 This mobile and tablet access to live stream in-market and national primetime games for free without any sort of cable or TV authentication is a really a big leap forward for cord cutters and NFL fans in general. We continue to look forward (hopefully) to the day we can get the same access on our TV connected devices as well.